It’s been less than one week since Apple unveiled the new 15-inch MacBook Pro with Retina display but rumors of “what’s next” are already swirling. The latest talk of the town suggests that Apple will be launching a 13-inch model sometime in October, perhaps around the same time as the new iPhone. News of the smaller Retina display MacBook Pro comes from Ming-Chi Kuo, an analyst with KGI that has a good track record with regards to Mac-related rumors. In the note shared with AppleInsider, the analyst said he expects Apple to increase production of a 13-inch MacBook Pro with Retina display in September. 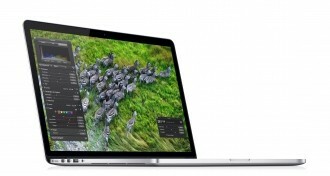 But Kuo isn’t the only one anticipating a smaller Retina display MacBook Pro later this year. Richard Shim and Jeff Lin with NPD DisplaySearch recently published a blog post where they claim a 13.-inch 2,560 x 1,600 resolution panel is in the works for a MacBook Pro to be launched in the fourth quarter. They say that production volume on the smaller panel is expected to be twice that of the 15.4-inch variety. Unit production on the 15.4-inch panels is expected to be less than 2 million for the 2012 calendar year. This would give Cupertino enough time to get units ready for an early October launch which, among other things, is just in time for the holiday buying season. We also have to assume that the smaller notebook would come with a price cut, making the system more affordable to the masses.